A friend and loyal reader of Skeptophilia, who also happens to be a veterinarian, sent me a message saying, "They're coming for me!" along with a link to a site entitled, "Autism Symptoms in Pets Rise as Pet Vaccination Rates Rise." The site, which I hardly need to point out is rife with confirmation bias, claims that vaccinating pets against such diseases as canine distemper, feline leukemia, rabies, and Bordetella is triggering behavioral changes similar to the ones seen in humans that have been vaccinated. The problem, of course, is that there are no behavioral changes in humans due to vaccination; as I have described repeatedly, there is no connection between vaccination and autism (or any other behavioral or neurological condition). None. Nyet. Nada. Bubkis. Rien. Presenting the evidence from his study at the 2015 American College of Veterinary Behaviorists, Dr. Dodman reported an autism-like condition, noting that “the vast majority of affected dogs were males, and many had other strange behaviors or physical conditions that accompanied the tail chasing, such as explosive aggression, partial seizures, phobias, skin conditions, gastrointestinal issues, object fixation and a tendency to shy away from people and other dogs.” He and his associates were further able to establish that two biomarkers common to children with autism were also present in the affected dogs. Which is all well and good, but doesn't establish any kind of correlation between those behaviors or biomarkers and vaccination. The only evidence she brings out is anecdotal; that some dogs exhibit temporary increases in irritability or aggression following the rabies vaccine, and those symptoms "mimic the ones described in discussions of canine autism." Oh, and there's the tired old Motive Fallacy argument; that since makers of vaccines profit from sales, they have a motive for covering up any bad side effects, which proves that said side effects exist. The illogic of which you'd think would be apparent to anyone, but evidently not. [D]ogs don't have autism. Most vet research shows OCD like behavior in dogs does have a genetic component, but these dogs don't have issues with being social with other dogs, being overstimulated, or anything else, and mostly recover if you give them a job to do, like flyball or herding... Most of it we see in high energy high drive dogs (collies, guard dogs, those sorts) that are in home environments that don't stimulate them much - so they go find their own, whether that's herding small children or licking their legs until they bleed or spinning in circles for hours. So superficially similar to some autistic behavior, but 95% of those dogs respond very quickly to environmental enrichment, and the rest to anxiolytics. But once again, it is unlikely that the arguments of a person who is an expert in her field will sway someone like Raines, who clearly has no particular need for evidence or logic to convince her. 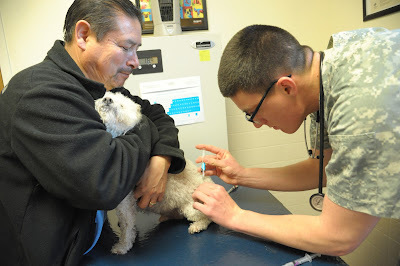 So the bottom line: vaccinate your pets. You're not going to trigger them to develop autism or obsessive-compulsive disorder, but you will protect them from horrible diseases like canine distemper, which is fatal 50% of the time even with the best veterinary care. Your pets depend on you for everything -- love, food, shelter, protection, and medical care. If you fall for Raines's claptrap, you will fail their trust in you, and in all likelihood, put them at a significant and unnecessary risk. And, in general, don't be swayed by emotionally-charged, fact-free arguments. Find out what the experts and researchers have to say, and think for yourself. Don't forget that we make our best decisions with our brains, not our guts.